1. The Prime Minister of the Democratic Socialist Republic of Sri Lanka, His Excellency Ranil Wickremesinghe, paid an Official Visit to Japan from 4 to 7 October 2015, on the invitation extended by the Prime Minister of Japan, His Excellency Shinzo Abe. 2. Prime Minister Abe and Prime Minister Wickremesinghe held a Summit Meeting on 6 October 2015. Both leaders reaffirmed that the strengthening partnership between the two countries, which share the fundamental value of the rule of law and democracy, can contribute to prosperity of the two countries as well as the Pacific and Indian Ocean region. For this purpose, the two leaders decided to deepen cooperation in the following multifaceted fields under a “Comprehensive Partnership.” Considering the importance of economic growth and development of Sri Lanka, the two leaders decided to put particular focus on taking initiatives in (i) Promotion of Investment and Trade, (ii) Cooperation on the National Development Plan in Sri Lanka, and (iii) National Reconciliation and Peacebuilding. 3. Prime Minister Wickremesinghe stated that the new Government will create a more favorable investment climate, ensuring transparency and good governance in order to attract investment from Japanese companies. 4. Recognizing Sri Lanka’s steady economic growth in recent years, which has increased its capacity in the manufacturing and distribution base, both leaders decided to hold an Economic Policy Dialogue at the Senior Officials’ level in the first half of 2016, as a framework to consider concrete measures for future enhancement of economic cooperation. 5. Both leaders welcomed the Sri Lanka Business Seminar organized by JETRO on 6 October 2015 and the business match-making for the IT industry initiated by JETRO in 2014. 6. Recognizing the importance of Sri Lanka as an investment partner in South Asia, both leaders decided to make maximum use of the Public- Private Joint Forum and Joint Business Co-operation Committee, as well as the Japanese investment promotion advisor attached to the Board of Investment of Sri Lanka for the promotion of trade and investment. 7. Both leaders reaffirmed that the two countries will continue to cooperate for the sustainable economic growth in Sri Lanka under the “Partnership for Quality Infrastructure.” In this context, the two leaders welcomed the signing of the Exchange of Notes for the Bandaranaike International Airport Development Project (Phase 2) (II). The two leaders also decided to initiate a new framework, namely the “Consultation on National Development Cooperation,” in addition to the Economic Cooperation Policy Dialogue to support the National Development Plan in Sri Lanka. 8. Prime Minister Wickremesinghe stated that the outcome of the study conducted by JICA on urban transport infrastructure including the introduction of a mass rapid transit system, which includes monorail, would be considered under the “Western Region Megapolis Plan” being developed by the Government of Sri Lanka. Prime Minister Wickremesinghe also stated that Japan’s advanced expertise and technologies could be utilized in the implementation of concrete projects such as expressways and the Urban Planning of the City of Kandy. Prime Minister Abe stated that Japan will continue its cooperation in the field of electricity including the formulation of power generation and transmission master plan, which was welcomed by Prime Minister Wickremesinghe. 9. Recognizing that the information and communication technologies support the foundation of national development, the two leaders shared the view that the two countries need to further strengthen and broaden bilateral cooperation in future development of the ICTs. Prime Minister Abe expressed his hope that the Integrated Services Digital Broadcasting-Terrestrial (ISDB-T) will be adopted in Sri Lanka. Prime Minister Wickremesinghe explained that a fair and transparent selection process based on functional capability and feasibility is currently under way. 10. Based on the outcome of the 3rd UN World Conference on Disaster Risk Reduction and recognizing the importance of public investment in disaster risk reduction from a long-term perspective, Prime Minister Abe expressed that Japan will continue to provide cooperation in the field of disaster risk reduction including conducting a survey, with a view to providing a meteorological radar system. Prime Minister Wickremesinghe expressed his appreciation for Japanese assistance, in both structural and non-structural measures provided thus far in the field of disaster risk reduction. Prime Minister Wickremesinghe supported the proposal by Prime Minister Abe to designate November 5 as the “World Tsunami Day” with the aim of deepening the understanding of Tsunami and raising awareness of the importance of taking precautionary measures against Tsunami. 11. Both leaders shared the view that the promotion of high efficiency coal- fired power generation will contribute to energy security and reduction of greenhouse gas emissions and concurred on the necessity of continuing public financial support by the OECD countries for high efficiency coal-fired power generation. In this regard, both leaders welcomed enhancement of cooperation in the area of Clean Coal Technologies (CCT). 12. Prime Minister Wickremesinghe briefed on the new Government’s efforts on the promotion of good governance and democracy, and its commitment towards national reconciliation and peacebuilding. Prime Minister Abe welcomed the efforts of the new National Government of Sri Lanka to address, urgently, the social economic issues of conflict affected communities, especially in the Northern and Eastern Provinces. It was recalled that Mr. Yasushi Akashi, Representative of the Government of Japan on Peace-Building, Rehabilitation and Reconstruction in Sri Lanka, contributed towards the process of conflict resolution and rehabilitation in Sri Lanka and that the Government of Japan played a vital role in successfully organizing the Tokyo Conference on Reconstruction and Development of Sri Lanka in 2003. Both leaders shared the view on the need to work together with the international community to initiate a process to support the Government of Sri Lanka in its efforts for rehabilitation and improvement of social and economic conditions of the conflict affected communities. 13. Prime Minister Abe stated that Japan will continue to support the development of community infrastructure including water supply and conducting the survey with a view to enhancing the facilities of the Faculty of Agriculture of the University of Jaffna. Prime Minister Abe, in addition to the provision of educational facilities in Mannar, stated that Japan will provide 240 million Yen through the World Food Programme (WFP) for the Food Assistance Programme in order to improve the school meals programme. 14. Prime Minister Abe commended the Government of Sri Lanka on co- sponsoring the resolution, which was adopted at the recently concluded Human Rights Council (HRC) Session in Geneva. Prime Minister Abe highlighted the visit of Mr. Motoo Noguchi in October 2015 as part of the contribution of Japan to the reconciliation process. 15. Both leaders welcomed the progress made thus far in the policy dialogue between the two countries, including the senior official level of the two Ministries of Foreign Affairs as well as the Sri Lanka-Japan Dialogue on Maritime Security and Oceanic Issues, as proposed in the Joint Statement in 2014. Both leaders expressed their expectation that these consultations will be held by the end of the year. 16. Prime Minister Abe briefed Prime Minister Wickremesinghe on Japan’s efforts, under the banner of “Proactive Contribution to Peace” based on the principle of international cooperation as well as the recent Legislation for Peace and Security. 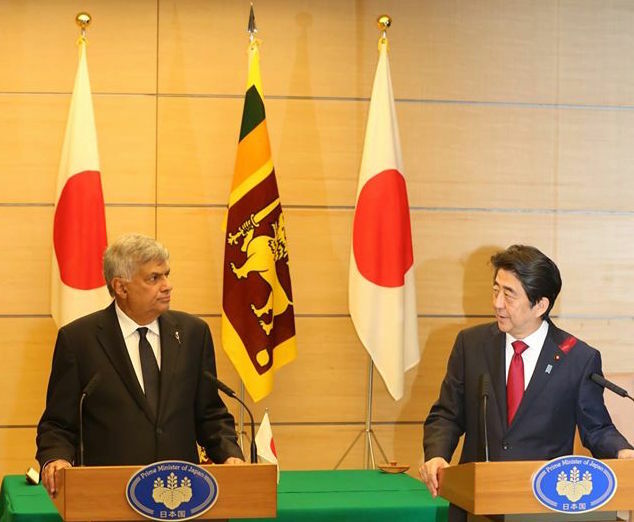 Prime Minister Wickremesinghe appreciated Japan’s efforts as a peace-loving nation and its contribution to global peace, stability and prosperity, and supported the efforts of the recent legislation as Japan’s own security policy. 17. As leaders of maritime nations, the two leaders reaffirmed the importance of the freedom of navigation and overflight of the high seas, civil aviation safety, unimpeded lawful commerce, and peaceful settlement of disputes in accordance with the principles of international law. Both leaders recognized the importance of improvement of maritime connectivity. 18. Prime Minister Abe stated that Japan would continue to extend its cooperation to contribute to the capacity building on maritime safety of Sri Lanka in such fields as maritime law enforcement, Search and Rescue (SAR), mitigation of disaster risks and environment protection, including the survey conducted with a view to providing patrol vessels. Prime Minister Wickremesinghe welcomed this initiative. 19. Both leaders recognized the importance of cooperation and exchanges between the two defense establishments on maritime security including through port calls by the vessels of the Japan Maritime Self- Defense Force (JMSDF). 20. Prime Minister Wickremesinghe appreciated Japan’s assistance for public service capacity building. Prime Minister Abe stated that Japan will provide training to approximately 1,800 Sri Lankan local public officials by 2016 under the “Project for Training of Frontline Officers in Community Development in Conflict-Affected Areas.” Prime Minister Abe affirmed the importance of capacity building and enhancement of public service delivery organizations in the field of good governance and the rule of law, and expressed that Japan will continue to conduct necessary cooperation to that end. Prime Minister Abe stated that Japan has thus far received 75 excellent young government officials from Sri Lanka as international students through “Japanese Grant Aid for Human Resource Development Scholarship (JDS) Project.” Both leaders affirmed the importance of the continuous implementation of JDS. 21. Both leaders reaffirmed the importance of further strengthening people-to-people exchanges in order to promote mutual trust and understanding between the peoples of the two countries and to lay a solid foundation to further promote future friendship and cooperation. From this view point, Prime Minister Abe expressed his intention to invite approximately 30 personnel from Sri Lanka through JENESYS 2015. 22. The two leaders reiterated their call for North Korea to address the concerns of the international community, including the early resolution of the abductions issue. They also urged North Korea to refrain from any further provocative actions including ballistic missile launches and to take concrete actions towards denuclearization of the Korean Peninsula. 23. Both leaders welcomed the recent adoption of the 2030 Agenda for Sustainable Development, which encompasses the idea of human security and global partnership, and efforts in fields such as health, education, and disaster risk reduction. They affirmed their continued close coordination in the implementation of the agenda. 24. Both leaders confirmed that they will promote cooperation towards an early reform of the UN Security Council through positive engagement in the intergovernmental negotiations in New York. Prime Minister Abe expressed his gratitude for Sri Lanka’s continued support for Japan’s bid for a permanent seat in the Security Council. 25. Both leaders decided to further cooperate in the area of nuclear disarmament, nuclear non-proliferation and peaceful uses of nuclear energy in order to realize a world free of nuclear weapons. « Domesticated Hybrid Court: Will Buddha Prevail Over Hegel & Marx?